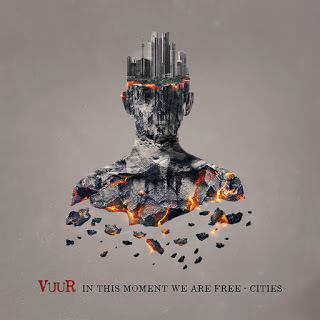 Well first let me say that I feel absolutely privileged that I can write this review of the debut album of Anneke van Giersbergen’s VUUR titled In This Moment We Are Free – Cities. The expectations for this album were very high. Anneke van Giersbergen, ex-The Gathering and for me pioneer of the female fronted genre, who hasn’t made any metal since the beginning of her solo career in 2007, other than guest appearances with Devin Townsend and Ayreon, is going to make progressive metal. How is it going to sound? And when it was announced that colleague and friend Marcela Bovio was leaving the band because of musical differences, anticipation for the album reached an even higher peak. With the exception of Marcela Bovio and Delain and Purest Of Pain guitarist Merel Bechtold, VUUR’s personnel is the same as that of The Gentle Storm, Anneke’s collaboration project with Arjen Lucassen, which is also the only metal music Anneke van Giersbergen let us hear in a long time. VUUR exists of longtime Anneke van Giersbergen alumni Ferry Duijsens, Johan van Stratum, Ed Warby, and newcomer Jord Otto. If I want to talk about the album I have to begin with Ed Warby. Because when hearing the opening track My Champion – Berlin, it is already clear that in addition to Anneke’s versatile unmatched vocals and leadership, Ed Warby is the absolute backbone of the band. For anyone who thinks that VUUR’s music has any resemblance to the music of The Gentle Storm, considering the fact it has almost the same band members, let me be clear, VUUR is totally different. In the second song Time – Rotterdam, you can clearly hear the progressive side of the band. Anneke shows what she’s made of and uses every skill and talent she has to show what VUUR is all about. Loud, raw and crystal-clear and always with Anneke’s warmth, modesty and positivity. Now, when I say raw, I don’t mean ontological or without having any idea, no Anneke’s vision is clear. VUUR is here to stay! Something else that she was clear about is wanting to have Joost van den Broek as the producer of the debut album. You can hear that he had a great hand in making In This Moment We Are Free – Cities and the order in which the tracks are placed on the album it’s also carefully thought of. The third track is The Martyr And The Saint – Beirut where guitarists Ferry Duijsens and Jord Otto show that you don’t always have to open all registers of your guitar to clearly be present. The same goes for bassist Johan van Stratum who other than doing what he is supposed to do on every song, clearly announces his presence on the fourth track The Fire – San Francisco where he, with some beautiful baselines shows that he is definitely irreplaceable. Next up is Rio’s song Freedom. Here Anneke shows that if you build up the song in a good way you can let the listener feel what you as an artist think that freedom is all about. Then there is the London track, Days Go By, this song had to familiarize people with the music of VUUR and boy did it succeed. What a powerful and spectacular song in which Anneke utilizes her vocal range and skill set. Then it’s up to Santiago’s Sail Away. A catchy chorus with many moments where the musicians have the time to shine. Shredding guitar solos and again a prominent role for drummer Ed Warby. Valley Of Diamonds – Mexico City, a song with a very threatening undertone, an outstanding buildup and a great variation in vocal styles. Musically it’s one of the best songs on the album if you ask me. Your Glorious Light Will Shine – Helsinki reflects the positive vibe I talked about earlier, again, this song is very interesting musically and it’s very hard to describe everything that’s happening in this one song. The guitarists Jord Otto and Ferry Duijsens do an outstanding job on this one. The same applies to the next song Save Me – Istanbul which brings a bit of culture to the table. Again, Anneke’s vocals are phenomenal with powerhouse Ed Warby in the background. The guitarists are shredding again like no tomorrow. The beautiful closing song Reunite – Paris is a real power ballad where Anneke thinks about the question what has happened to the level of tolerance in the world, a critical note but with the sentence “I will watch over you” still blaring through your speakers. The song is a beautiful closing track from an outstanding debut album and speaks about all of the horrible things that has happened in the world regarding terrorism and the growing intolerance in the world. I think it is no surprise that the song Reunite is coupled with the city Paris. In every song the album title In This Moment We Are Free comes back, it’s a central theme. Do you want to know how Anneke thinks about freedom or how this album came to pass? This and many other things I discuss with yours truly in an interview I had on the seventh of September. It is uploaded tomorrow on DutchMetalManiac. VUUR is here and they are here to stay! Spread the word! You can also check two parts of Promoting Bands in which Tim van Velthuysen wrote about VUUR here and here, as well as an interview with Anneke van Giersbergen by Glenn van der Heijden here. Joost van der Leij also wrote an live review about Dynamo Metalfest with VUUR in its lineup here.